In many states, educators seeking certification as K-12 library media specialists take the Praxis II 5311 test. The Educational Testing Service (ETS) offers the Praxis 5311 exam to candidates who meet the educational requirements for public school librarians in their state. Does your state require the 5311 Library Media Specialist Exam? Ask your college adviser. Next, research certification requirements for school librarians on your state department of education website, and then cross-check the state’s information with the ETS Praxis site. How do I register for the Praxis II 5311 exam? First, establish an account on the ETS Praxis site. There you will find information about testing sites, dates, and fees. The registration fee for Praxis II Library Media Specialist test is $120. On the day of the exam, have your test ticket (obtained from ETS) and a photo ID. Be sure that your name is spelled the same on all test-related documents. Wear comfortable clothes and minimal jewelry. Do not carry pencils, papers, calculators, phones, or other personal items into the testing site. May I request special accommodations for testing? Yes. ETS offers additional testing time and rest breaks and similar accommodations for non-native speakers of English and test takers with disabilities or health challenges. Apply for special accommodations through ETS Praxis. What kind of test is the Praxis 5311 exam? What is a passing score on the Praxis 5311? Each state determines the Praxis 5311 score it requires for certification as a Library Media Specialist. Ask your college adviser about the passing scores in your state and consult the ETS table of passing scores. Immediately upon completion of the exam, you will receive an unofficial score report. Within three weeks of the test date, your official score should be available through ETS. How should I study for the Praxis 5311? Logging in endless hours of aimless study time is not the best preparation for the Praxis 5311. The Praxis Library Media Specialist test is not a rehash of your college classes. It is a test of whether your degree work and experience have prepared you for leadership in developing and managing a public school’s learning resources. Mometrix Test Preparation materials teach you to anticipate the questions that appear on the Praxis exam and to develop a knack for answering them correctly. The Mometrix study plan features self-testing – knowing what you know and don’t know — and plenty of practice in test taking. 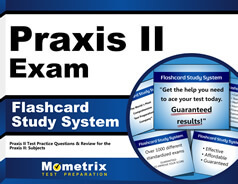 Are you ready to practice for the Praxis 5311? The first stop on your journey to Library Media Specialist test success should be the Mometrix Academy’s free, online video preview of Praxis 5311 questions. Notice how the questions prompt you to apply your college education to a real-world professional environment. With certification, a major life transition is in store for you, and to assist you, Mometrix offers the most comprehensive, up-to-date Praxis 5311 study guide on the market. 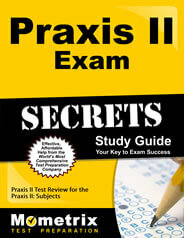 The Praxis II Library Media Specialist (5311) Exam Secrets Study Guide, available in print or e-book formats, offers practice tests over every section of the 5311 exam. The correct answers are provided with explanations, so the test taker can analyze the wording of questions with to avoid mistaken responses. The Secrets Study Guide also includes advice on overcoming test anxiety by learning test taking techniques from testing experts. Do you need help in associating terms and definitions or keeping track of the concepts involved in hundreds of test questions? Mometrix can put the perfect study aid in your hands. Mometrix Flashcard Secrets–a deck of cards with questions on one side and answers on the other—make study time available at work, in traffic, or in between classes. Flashcards appeal to the senses and make recollection of test content easy and fun. You can use the Flashcards yourself or invite friends to join you in studying. Either way, this is one deck that will not be stacked against you.